As people are probably aware from my fairly frequent posts about Hong Kong collectible toy company Hot Toys' Movie Masterpiece figures, I am a bit of a fan of the collectible figurine. Especially the ones that look superbly close to the real life characters they're modeled after. 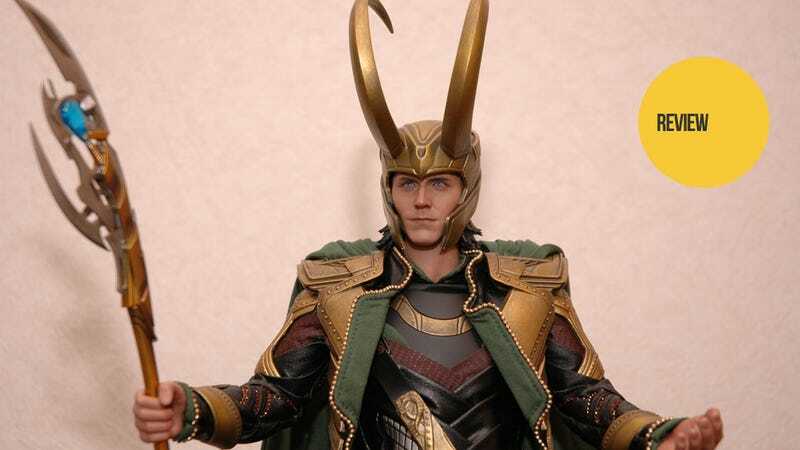 So, the latest major hit to my wallet has been the Hot Toys Avengers Loki figure. As always, the details to the character's face are astounding. It's not an exact copy of Tom Hiddleston, but it's still damn close and probably the best 12-inch figure recreation of the actor I've seen so far. In terms of facial detail, Loki is probably one of my favorite Hot Toys collectibles alongside my Captain America and Joker figures. More than the facial features, however, I was completely blown away by the details to Loki's costume. One of the things I really enjoy about the Hot Toys Movie Masterpiece line is how they really let you appreciate the costume design that you tend to overlook when watching the actual movie. Looking at the intricate details of the figure's costume lets you notice all the folds, layers, and little accessories that the movie costume designer probably spent hours, if not days, milling over to create the final product. As for flaws, the standard 12-inch figure-in-clothes mobility issues apply, though not as drastic as some other figures. The clothes and armor are rather delicate, but even more so – due to their shape – are the helmet and spear. For God's sake, keep this thing out of young children's reach; they WILL break it. The figure comes with removable helmet and cape, 2 spears (long and short versions), 2 daggers (to stab your Thor figure with), shackles, and muzzle. All in all, a somewhat limited selection of props, but considering how awesome the figure itself looks, it's not that much of a drawback. Overall, I am really, really happy with my purchase of this figure. While it's not exactly in the lineup of Avengers "heroes," it has no trouble fitting in on the shelf among the good guys. Also, now that I own Loki, Thor, and Captain America, I can totally have fun expanding on that image Tom Hiddleston tweeted from the day he ransacked the Avengers props department.